Run tests in parallel but report results in a deterministic order (to aid diff-based analysis of test output). Progress reporting for individual QuickCheck properties and for the whole suite being run. 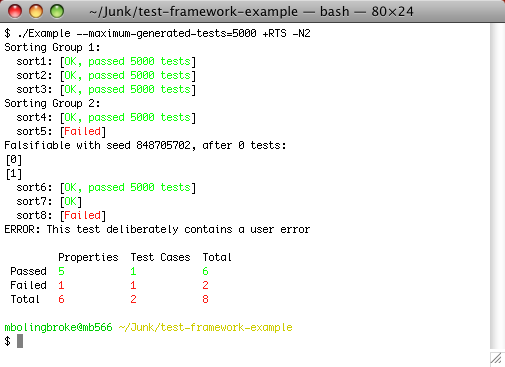 Filter the tests to be run using patterns specified on the command line. Hierarchical, colored display of test results. Reporting of test statistics (number of tests run, number failed etc.). Extensibility: add your own test providers above and beyond those provided. Reporting of the seed used upon a failed QuickCheck run, so you can reproduce the failure if necessary. If you like test-framework you may also want to check out Oscar Finnsson's test-framework-th package for generating your test groups programatically. -- please see the file "example/Test/Framework/Example.lhs" in the source tree. test_sort8 = error "This test deliberately contains a user error"
You may need adjust the version number to match the one on your machine, as reported by ghc-pkg list. Alternatively, you can supply the -package QuickCheck-1.2.0.0 flag when invoking GHC (again you may need to change the version number to match your installed QuickCheck version). This happens because GHC finds it convenient to eta-expand the calls to error, so we can no longer observe the failure. This is dodgy behaviour by GHC, but it's unlikely to change any time soon, so the workaround is to compile your tests with -O0 (the default). If you really do want to compile your tests with optimisations enabled, you should also be able to supply the -fno-full-laziness flag along with your -O1 or -O2 flag. However, if new optimisations are added to GHC they may break this workaround - it's probably safest to turn optimisation off altogether. The framework is built with an extensible architecture that allows anyone to add their own test "provider". All of the supplied providers are built using this mechanism, and so you probably want to install not only the infrastructure package (test-framework), but also the commonly-used providers test-framework-quickcheck and test-framework-hunit. A description of the options available can be obtained by using the option --help on the command line. An optional prefixed bang ! which negates the pattern. If the pattern does not contain a slash /, the framework checks for a match against any single component of the path. A test will be run if it matches any of the patterns supplied with -t.
You can submit a ticket at Lighthouse to report a bug.